At least 17 people have been killed in a gun battle between former militiamen and security forces in Brazzaville, the capital of the Republic of Congo. A government spokesman said three police officers, two civilians and 12 attackers were killed Monday. The shooting came weeks after President Denis Sassou Nguesso won a disputed re-election bid for his third term. Police say former members of an anti-Nguesso militia called "The Ninjas" raided local police, military and government offices and set them on fire. Witnesses said gunfire erupted before dawn in the capital’s southern neighborhoods, a stronghold for the opposition party, and continued into early afternoon, when troops flooded the city streets. Tuesday there was relative calm in Brazzaville, but most schools and stores remain closed. It was the first violence seen since the contested March 20 election. A government spokesman said there is no proof the Ninja militia was behind the attack, but investigations are underway. The Ninjas were one of the major anti-government forces that fought Nguesso in a 1997-99 civil war. Residents who witnessed the shooting said they saw armed men in civilian attire, but could not say if they were Ninja militia. 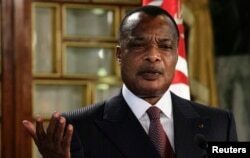 Nguesso, 72, has ruled Congo for more than three decades. He won re-election in March after he got voter approval to remove age and term limits that would have blocked him from participating. Official results show Nguesso won about 60 percent of the vote.